Well known for being a leader in wind energy, the State of Texas is now home to a new $123 million, 50 MW biomass power plant, the first major woody biomass plant in the state—and there are more biomass facilities in the works. Texas is renowned for its wide open spaces, cattle ranching, and for being a leader in wind power. But looking past the stereotypes of nearly every John Wayne movie, the state also has a forest resource. One company is already turning that woody biomass into renewable energy, and more biomass projects are on the way. Aspen Power LLC is commissioning a $123 million, 50-megawatt biomass power plant in Lufkin, Texas, that will consume about 525,000 green tons of logging debris and municipal wood waste per year. It is the first major woody biomass power plant in the state and started operations this past August. Texas renewable energy consultant, Mark Alan Robinson, working with the firms GreenPower4Texas and Sustainable Texas, says the commissioning of the Aspen Power plant is significant from two perspectives. First, it reinforces that renewable power development is occurring somewhere other than the east and west coasts. Secondly, it shows that a group of energy-savvy entrepreneurs with a vision can come together to make these renewable energy projects a reality, even without incentives. While it may not have the wind power potential of West Texas, East Texas is becoming a force to be reckoned with in biomass power. Southern Power Company (a subsidiary of utility giant Southern Company) is currently building the 100 MW Nacogdoches biomass power plant in Sacul, Texas. Groundbreaking occurred in November 2009, and commercial operation is projected for the summer of 2012. When completed, the Nacogdoches plant will be the largest biomass-fueled electric generating facility in the U.S. The plant's output is committed through a 20-year power purchase agreement with Austin Energy, the municipal utility owned by, and serving, the city of Austin, Texas. The plant will consist of a bubbling fluidized bed boiler, a condensing steam turbine generator with an evaporative cooling tower, wood fuel handling system, and auxiliary support equipment. The project will feature the latest in boiler and emissions control technology to achieve best available emissions, according to Southern Power. The Southern Power plant will be built on 165 acres and be fueled with biomass materials, including forest residue from the surrounding areas, wood processing residues, and clean municipal wood waste. The project will require approximately one million tons of fuel annually, which will be sourced within a 75-mile radius of the project site. Biomass generation is being used to help meet the state's Renewable Portfolio Standard, with the output serving the City of Austin. Southern Power has executed an agreement with Fagen Inc. of Granite Falls, Minnesota, for engineering, procurement, and construction (EPC) of the Nacogdoches biomass power plant. And there are further biomass projects. Earlier this year, Argan Inc.announced that its wholly owned subsidiary, Gemma Power Systems (GPS), has signed an EPC contract with East Texas Electric Cooperative Inc. (ETEC) for an approximately $165 million contract to design and build a 49.9 MW, biomass-fired power plant near Woodville, Texas. ETEC has received the necessary approvals to move forward with the $190 million development. ETEC has licensed NAPCO, locally owned and operated in Woodville, as the provider of wood chips and other wood materials to fuel the plant. This partnership is expected to create a market for the abundant wood by-products already available in the area. Construction is scheduled to begin in early 2012 with the goal of providing clean, renewable power to cooperative members by 2014. Returning to the state's completed biomass power plant, Aspen Power, it is located on a 67-acre tract within the city of Lufkin and will gather its biomass supply from about a 70-mile radius. Lufkin was an ideal location for the power plant because it is located in the center of the Pineywoods of East Texas. The site has some definite advantages: five 138,000-volt power transmission lines cross the plant property; the plant is built in an area of Texas where investors are allowed to build power plants to serve the deregulated electricity market; and there is a good road system to access the wood fiber feedstock, and a good water supply to generate the steam to drive turbines for electrical power generators. Rather than contracting out the acquisition and supply of the woody biomass, an affiliated company, Angelina Fuels LLC, will handle both the acquisition and transport of the feedstock to the power plant. They will deliver about 1500 tons per day. It will come from four sources, logging debris, in-woods chipping, urban waste, and mill waste. Aspen Power president Danny Vines says they believe having direct control over the logistics of gathering and delivering the fiber supply will be a huge advantage in that it gives them a guaranteed fuel supply in the most cost-effective way. "It just made a lot of business sense to create the infrastructure from a supply standpoint because currently the infrastructure to provide fuel to these plants does not exist in this geographical region," says Vines. He brings forestry sector expertise and experience to his position at Aspen Power, having earned a college degree in forestry with a wood technology option in 1978. He became involved in the wood preserving business to manufacture products such as utility poles and pilings, and later switched to the natural gas gathering, processing, and distribution industry. Vines' experience includes involvement in the construction and operation of two biomass boilers, which happen to be identical matches to the boiler being used in the Lufkin facility. 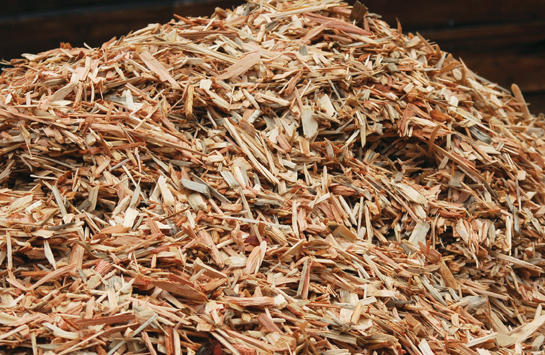 All of the feedstock is either chipped or ground, except for material coming from sawmills. That waste has already typically been processed through a chipper and is often mixed with other mill waste such as sawdust. Prior to the remaining biomass material arriving at the power plant, Angelina Fuels uses a Diamond Z tub grinder or a Morbark drum chipper to reduce the woody biomass size to the consistency required by the power plant. For managing green logging slash immediately after logging operations, the company uses a John Deere slash bundler for two purposes. First, it gives the power plant the ability to gather the forest slash, bundle it, and place it in storage, giving them up to a five month supply of plant fuel. Secondly, by putting the green slash bundles into inventory, the wood fiber has time to air dry. Vines says that ground-up green forest slash doesn't dry. It rots. So the drying cycle is critical to lower its moisture content while maximizing its BTU content, and thus allowing Aspen Power to optimize its boiler efficiency using this particular feedstock. "The lower the moisture content, the more efficient our boiler operation is," says Vines. "For burning stump green material, we are operating at about 70.4 percent boiler efficiency. If we burn material with 10 percent moisture content, we are operating at about 83 percent boiler efficiency." According to the Texas Forest Service, there is no shortage of forest biomass in the vicinity of the power plant. In a report detailing trends and usage in the timber industry, they found that Angelina County, of which Lufkin is the county seat, is one of the top five timber producing counties in Texas, with approximately 29.8 million cubic feet of pine and 3.9 million cubic feet of hardwood harvested annually. The forest service says that about 8.4 billion pounds of logging debris is left to rot or be burned following completion of logging operations, representing about 8900 tons per day of woody biomass fuel currently available. The biomass fuel at the Aspen Power plant is consumed using a direct-fired process similar to fossil fuel-fired power generating plants, but with lower air emissions. The fuel burns and heats water in a boiler that produces high-pressure steam, which is then piped to a steam turbine where it flows over a series of aerodynamic blades, causing the turbine to rotate. The turbine is connected to an electrical generator that produces the electricity. Aspen Power was able to overcome an environmental challenge from three protesters in Lufkin who had concerns about air pollution and were able to shut down construction of the plant for nine months. Vines says the plant is using selective catalytic reduction (SCR) technology that is controlling 99.3 percent of particulate air emissions. He says it is controlling high air emissions to about 63 times lower than the national standard. "It will be the cleanest combustion generator pretty much in the nation," says Vines. About 60 percent of deregulated power generated in Texas comes from natural gas fueled power plants. Vines says the Aspen Power plant is competitive with power generated from natural gas on a BTU basis, and a bit more expensive than power generated from coal. Comparing the costs to generate an equal amount of BTUs, he says natural gas would cost $1450, while biomass would be $550—substantially less on a BTU basis.